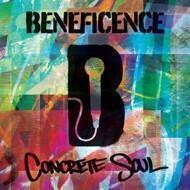 After 17 years in the game and numerous collaborations with top-notch producers and emcees, Beneficence drops his 5th solo album entitled "Concrete Soul". Sticking to the true formula of golden era antics, Beneficence brings a stellar line up of guest appearances including lyrical heavyweights like Billy Danze (of M.O.P. ), Masta Ace, Roc Marciano, A.G. (of D.I.T.C. ), Grap Luva, Lord Tariq, Rampage The Last Boy Scout, El Da Sensei and many more. Your eardrums can enjoy witnessing soulful and hard-hitting boom bap beats courtesy of Buckwild (of D.I.T.C. ), K-Def, Confidence (of Rashad & Confidence), Da Beatminerz, Gensu Dean, 12 Finger Dan, Presto, Molemen and a bunch of other excellent beatsmiths. "Concrete Soul" displays slick, thought provoking rhyme styles from smooth laid back joints such as the K-Def produced "Cold Train" (feat. Grap Luva & Rob-O) to rough and rugged Billy Danze featured "Art of War". The album brings a soul street element that's been missing from nowadays rap music, along with plenty of dope cuts, samples, and pure satisfaction for true school hip-hop heads worldwide who are still in love with that raw and authentic 90's sound. Let's carry the tradition!